The creator behind the HTC_IME theme for Swype that was posted last week is back for more with a whole lineup of color-themed awesomeness. And while the previous theme we posted was for rooted users only, these new themes are for everyone. That’s right, everyone with a Motorola Droid can install these. 2. Uninstall any previous versions of Swype. 3. Open the apk that you just downloaded and install. 4. Go into Settings>Language & keyboard> and make sure Swype is checked. 6. 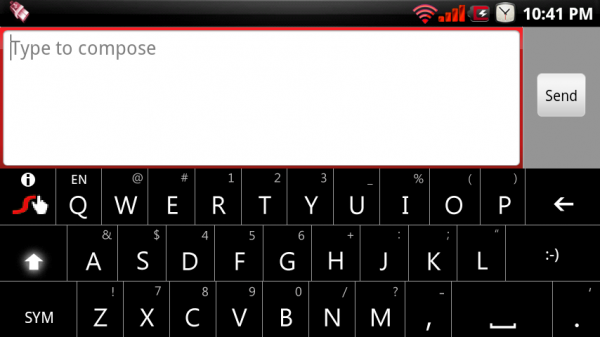 Open a text field, long press, select “input method” and then select Swype. *Note 1* – For those of you who had previously installed the HTC_IME theme, you will need to remove the Swype apk from your system>app folder before you can complete these instructions. And remember that the stock Swype is always available through our downloads page. Pretty cool right? Let us know if you run into any issues! Cheers Tony (sh0ebox) for putting these together! Amazing work.